JOHN CLAUDIUS MONTGOMERY, of whom hereafter. Emma Clara; Barbara Caroline; Mary Elizabeth; Louisa Gertrude Douglas. Patricia Douglas Methven Beresford, born in 1924, who sold Learmount Park in 1944 to the Northern Ireland Department of Agriculture. THE BERESFORDS acquired Learmount Park through the marriage of John Beresford to the heiress Barbara Montgomery, but he never lived in it and died at Walworth, Ballykelly, in 1805. His son, Henry Barré Beresford, did not live in it either: His estate was let out to the McCauslands. He himself worked as estate agent to his own brother Marcus, on his estate at Ballyquin. It was only when Henry Barré Beresford retired from this position that he started to modernize the Beresford estate. He began with great plans for the old Montgomery house. Instead of demolishing it, his architect, John B Keane, incorporated it as an east wing on to a new mock Tudor-styled castle. The same architect also designed, in the same style, the western gate lodge house at Stratton's Brae, which is now sadly gone. He may even have been responsible for the design of the parish church which was built on land donated by the Beresfords, and consecrated in 1831. A school and schoolhouse had already been established on a site close by. Henry Barré Beresford died in 1837 and was succeeded by his son John Barré Beresford, who continued with the building plans begun by his father. Another gate lodge house, in a different design, was built at the western entrance, where Park Recycling Centre is now located. Another lodge was also built on the main entrance. 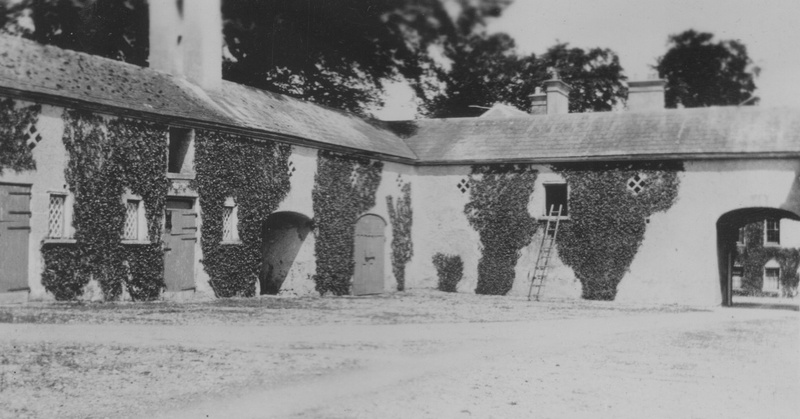 At Learmount Castle, coaching houses were provided for the horses, including those which worked on the farm, and grooms and coachmen employed to look after them. A walled garden provided vegetables and work for gardeners. Gamekeepers and bailiffs were also employed, all overseen by an estate manager. Control of the estate passed from John Barré Beresford to his grandson Ralph, when the former died in 1895 and was commemorated by a stained glass window in the parish church. 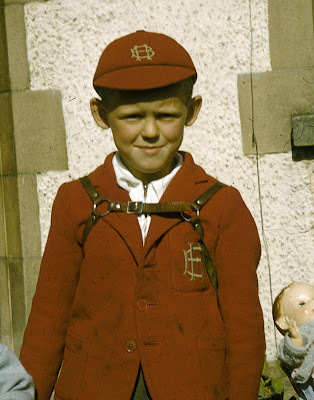 Ralph was a minor aged 11 at the time, and did not inherit the property until 1922. When Harry Ralph Beresford died in 1925, the estate began to decline. Compulsory sale of tenant lands and death duties would in due course take its toil. The Osgood family, tea planters from overseas, hired out the property for about four years, long enough it has been reported, for them to marry off two daughters. While they were there they played tennis, looked after horses and dogs, and even installed electricity, supplied by a water wheel in the estate grounds. 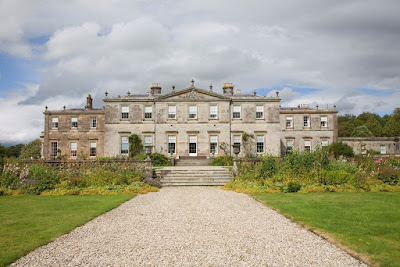 During this time the estate was owned by Colonel Marcus Beresford, though he never lived in it and Learmount Castle was left vacant until the 2nd World War. Local people were employed as cook and janitor, and an Aga cooker and the telephone were installed. Colonel Beresford was killed in London due to enemy action and his daughter, Patricia, decided to sell the property. The Forestry Service promptly bought it and the buildings were allowed to fall into disrepair. The Castle was granted a temporary reprieve, when the Youth Hostel Association set up a hostel in the main building, run by wardens Doreen and Marcus Lowther. However, still no money was available for repairs. It was decided that the old (Montgomery) wing should be demolished and replaced by a low wall, compatible with the style of the newer building. But when the lease for the hostel expired in 1983, the youth hostel association refused to renew it, so the Lowthers left and the cycle of decay continued. 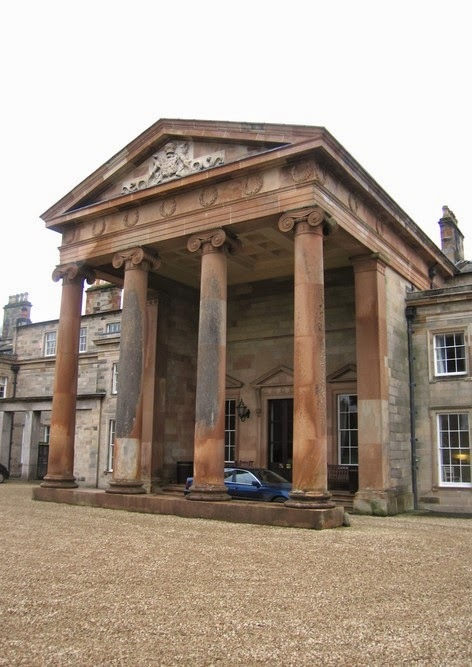 Prior to this, the gate lodges at the western and eastern entrances to the estate were demolished. Only the old coaching house survived intact, bought by Mr Peter Mullan, who converted it into a home and a self catering apartment. He has also reclaimed the gardens, reseeding them as a neat lawn and adding a very attractive pond. He stabilized the back of the castle which has enhanced its appearance. LEARMOUNT CASTLE, near Claudy, County Londonderry, is a Tudor-Gothic house, built in 1830 by Henry Barré Beresford. The main block has a gabled front and pointed finials on the gables; and a battlemented porch. There is a battlemented wing set back, ending in a slender, round battlemented tower and turret. The house is situated above a steep, terraced drop to the River Faughan below. The terracing is grassed and decorated with ornamental yew trees. There is an unused walled garden to the immediate south of the house. Learmount is close to the village of Park in County Londonderry. Learmount Forest covers just over 3,000 acres of the foothills at the northern face of the Sperrin Mountains. Bought by the Forest Service at the end of the 2nd World War, it has over fifteen different tree species planted, with some well over 100 years old. This is due to the planting of selected trees by Henry Barré de la Poer Beresford, who came from Staffordshire as landlord at the time of the Plantation by the Livery Companies. The imposing castle was built by him in 1830 as an extension of an older building erected by a Captain Montgomery around 1710. The castle was used by Ashleigh House Girls School (Belfast) during the war, and then by the Youth Hostel Association until later it was bought by the present private owner. 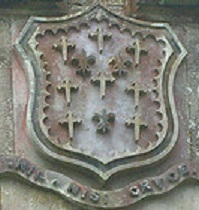 The Beresford coat-of-arms emblazons the doorway of the Castle, with the family motto Nil Nisi Cruce - No dependence but in the cross; and the Arms, a semée of cross crosslets fitchée and three fleurs-de-lis within a border engrained sable. The demesne contains commercial plantations and mature trees in an area noted by Lewis in 1837 in the Topographical Dictionary, for its ‘large and valuable timber …’. Paths are maintained and the site is an amenity. "The way I remember it may not actually be the way it was, - the memory does play tricks after forty years. One thing I do know is that the far side in the photo was already derelict at that stage and was blocked off although it was possible to get in through the basement. It was said to be haunted so had not been used for some time. Apart from that I remember a very impressive staircase opposite the front entrance. There was a large room to the right of the front door. It was used as the common room with dining area at that time but it had obviously been a beautiful room. The fireplace matched the proportions of the room. It was so big that my brother was able to sit cross-legged on the mantelpiece ... the staircase went straight up opposite the front door towards the back of the house and then divided on the first landing with flights going up in both directions. When we were there the room behind the large common room was the kitchen but originally when it was a family home, the kitchen was probably in the basement, which you can see from the photos went the full length of the house." LOUGH ESKE CASTLE, near Donegal, County Donegal, is a Elizabethan-Revival mansion of 1859-61 by the architect FitzGibbon Louch. 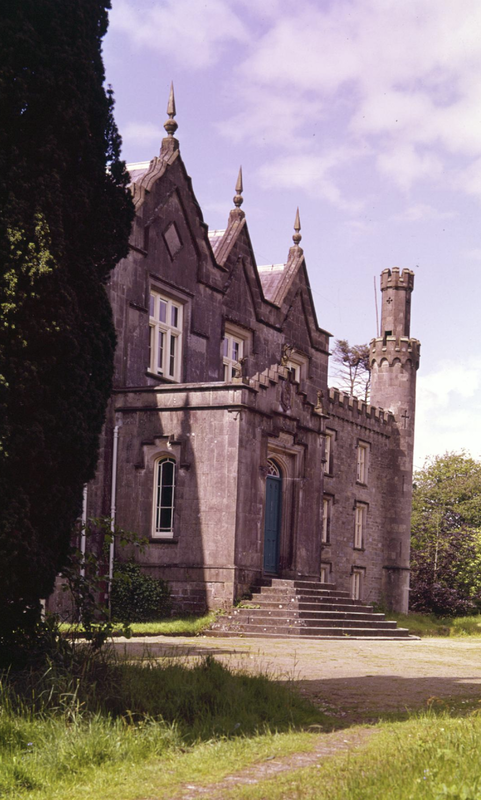 It was built on the site of an older castle for the Donegal branch of the Brooke family (whose ancestor erected Donegal Castle). There is an imposing four-storey square tower at one end. A large Gothic porch stands between two oriels; the parapet is crenellated, with two blind gables. The tower has machiolations, crow-step battlements, and curved, corbelled oriels. A date stone of 1621 on the plantation house displays initials "WH" for William Hamilton, father of Gavin Hamilton (progenitor of Brown Hall.) and "IM" for Joan Merbury, sister of the wife of the William Brooke of Colebrooke in Cheshire (father of Sir Basil Brooke, proprietor of Donegal Castle). 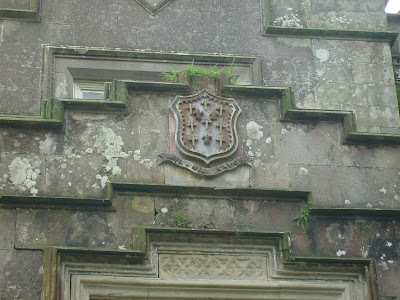 Thus the Hamilton and Merbury armorial bearings beside the central beaver of Brooke surmount the main entrance of the Lough Eske Castle Hotel. All the stone for the ornamental stonework came from Monaghan’s Quarry, Drimkeelan, near Frosses, and the road from there to Lough Eske was built to transport the sandstone or freestone for the Castle. Mr Brooke even brought two Clydesdale horses with cockney drivers from England to draw the stone. His ancestors had acquired the Lough Eske estate in 1717 through a marriage with the Lough Eske Knoxes. Thomas Brooke, who built the castle, was not a Brooke by birth. He was born Thomas Young, but changed his surname to order inherit the property. The Brooke coat-of-arms still stands over the door on the east and main entrance. The tower is an impressive part of the Castle’s architecture and dominates the whole building and adjoining countryside. The tower held the flagstaff where the family flag would have flown, visible for miles around. Beneath the battlements, all along the front of the castle were a line of finely carved gargoyles faces, no two alike. 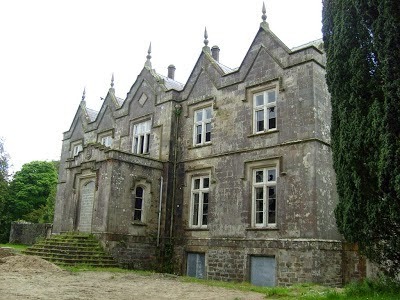 During the time that the estate belonged to the Irish forestry commission most of the gargoyles were stolen. In 1859, architect-designed enhancements were installed by a local contractor. In 1897, after visiting audience with Prince ofWales, embarked on modern improvements projects continued in 1911, with pleasure-rooms, steam-heated “Roman Bath”; master suite and guest rooms. 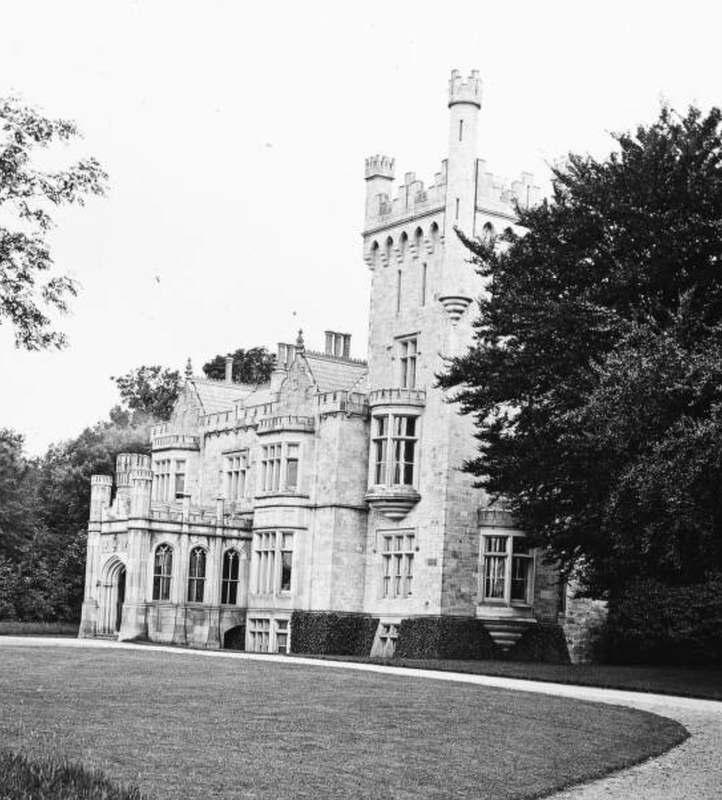 Colonel de Vere Brooke inherited the estate in 1884 and remained there for ten years until Lough Eske was sold, in 1894, to Major-General Henry George White. During this period the the estate comprised 15,134 acres. General White had a great love for the area and he was buried close to the lake, where there stands a fine Celtic high cross. The burial site is enclosed by a wall and railings, with double gates at the entrance which bear plaques. One of these carries the figure of a pelican, the symbol of mortality, with the inscription “Beware in Time”. The second plaque bears the inscription Virtus Semper Vincit (Virtue Always Conquers). The burial plot is maintained with the help of a bequest invested in the representative church body, donated by Mrs Sybil Georgina Barnes, General White's sister. The Castle was operated it as a hotel from 1930 to 1939. In 1939, a curtain in the ballroom caught fire due to a candle that hadn’t been extinguished. The ballroom and billiards-room were destroyed, and by the time the fire brigade was able to attend (it had to come from Londonderry in Northern Ireland) most of that wing of the castle had been destroyed. 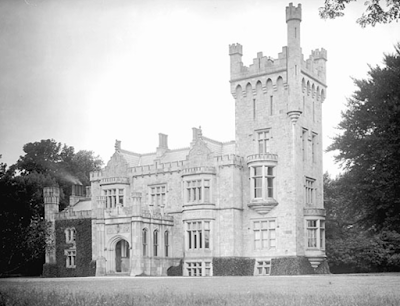 Thereafter the Knee family decided to vacate Lough Eske and sold the estate to Mr Scott Swan, who sold the castle to an American gentleman, Bernard Etzin, of Ardnamona House. In the early 1980s the castle and estate were taken over by the Irish forestry commission, which had little interest in the castle itself. Consequently, Lough Eske Castle became derelict. The present owners, Solis Hotels, bought the estate (all that remained of the house at the time were the outer walls). Trees grew inside the castle and their strengthening roots threatened to knock the castle down altogether. 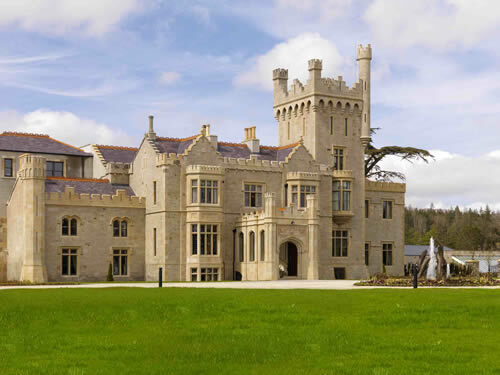 After eighteen months and a considerable financial investment, Lough Eske Castle has been faithfully restored, including the interiors of the reception rooms. "NORTHERN IRELAND may not have as many opportunities for game shooting as elsewhere in the British Isles, but in Baronscourt it certainly has one of the most beautiful. Situated in a valley at the base of the Sperrin Mountains, Baronscourt estate, all 15,000 acres of it, is something of a sporting paradise. Not only does it cater for those in pursuit of sporting pheasants, it can also satisfy the appetite of both the deerstalker and river angler. Combine this with a main house as majestic on the outside as it is within and you’ve pretty much met the needs of any avid sportsman. On the morning of the shoot I was greeted with snow and bright sun. Saddled up and ready to go after breakfast, I made my way along the remaining eight miles from my hotel to the estate. The scenery just got better and better as I weaved through the country lanes. After passing through the main gates I was met by a beater who pointed me towards the main house, and soon after I grabbed a glimpse of the impressive Clock Tower and Governor’s Lodge - a building that is part of the estate’s stable yard and which dates back to 1890. I soon arrived at Barons Court - the main house and seat of the Duke of Abercorn’s family since 1610 - to be met by my host Jamie, Marquess of Hamilton. I was introduced to the rest of the guns before grabbing an opportunity to speak with Jamie about the shoot as everyone finished their breakfast. “There has been game shooting at Baronscourt since the mid-1800s,” said Jamie. “It is something we have always nurtured under our own management. This includes retaining, as best as possible, our own bloodline of pheasant. We’re very lucky in terms of the topography, which really lends itself to sporting birds. Sammy Pollock, our head-keeper, is assisted by his son, Stephen, and daughter, Jeanette, as well as a wealth of other locals who help on shoot days. “Sport at Baronscourt is all about balance and this includes the number of game shooting days that are put on. In order to protect our stocks we don’t overshoot the land, and each season we will establish how many shoot days we should have so as not to upset this balance. There are three types of game shooting on the estate; client days, family days, local syndicate days and walked-up days. The shoot is mainly run for the family but we feel in order to make full use of the land, and also generate extra income to pump back into the shoot, it is wise to let out days. We have one group of guns that come here six times a year for walked-up game shooting. Conservation is also very much to the fore. Every decision is carefully thought out in terms of the impact it will have and the benefits that can be drawn from it. And this is not only in terms of game shooting - a Laurent Perrier Award for wild game conservation in relation to the management of our wild herd of Japanese sika, and the Royal Forestry Society’s Duke of Cornwall Award highlights this. All of Baroncourt’s days are managed by Jamie - a personal and knowledgeable touch which ensures everything runs smoothly. The estate is fortunate to offer a variety of game for its discerning clients. “We are very lucky to have a number of woodcock on the estate and have devised drives whereby the guns and beaters can actually walk together along custom-made tracks cut through coniferous woods in pursuit of this sporting bird,” said Jamie. A call to the By-turn, the first drive, marked the end of our conversation, and it was then to the gun-bus - a fine specimen adorned on the inside with framed photographs of previous shoots and family members from years gone by. Driven along by helper Robert Freeborn we soon found ourselves in a snow-strewn landscape. I found myself behind Lord Iveagh from the Elveden estate. Resplendent in his family’s Guinness tie, it wasn’t long before he was sampling some of Baronscourt’s best. As snow clouds loomed in the distance, pheasants took flight over the line of guns, their rich colours, reflected by a glowing winter sun were stark against a darkened sky. They came in a steady trickle and the drive lasted long enough for each gun to get a good share of the sport. Elevenses in a log cabin followed McKelvey’s Kale - a very scenic drive that backed onto one of the estate’s three lakes and the main house. The team tucked in to sausage rolls, soup and a nip of sloe gin around the warmth of a log fire. Once suitably fortified it was on to the Spinney. With the guns lined out in front of tall, coniferous woodland it didn’t take an expert to realise more testing birds were on their way. Sure enough, high bird after high bird powered up over the guns and with the bright sun burning in the sky, only a few were deterred from lifting to a sporting height. With lunch looming, there was a treat in store for the guns - a duck drive. Not only was it a great way to end the morning’s game shooting, it provided uninterrupted sport as the birds lifted in a frenzy of flight. The guns enjoyed a good half an hour of sport and bagged 110 head. Over lunch I bent the ear of head-keeper Sammy Pollock: “I’ve worked on this estate for 35 years,” he told me. “I started off in the estate’s forestry department before a position came up to join the shoot. I had always had an interest in game shooting so to become an under-keeper was a chance that I really wanted to take. Bob Godfrey was the head-keeper at the time, so I worked under him for a number of years before working under his successor, Trevor Miskelly. Then I was made head-keeper 19 years ago and have been so ever since.” Son and daughter Stephen and Jeanette joined Sammy when they left school. And, apart from enjoying everything ‘outdoors’, Jeanette also has an interest in water colour painting, something she does on commission. And Sammy even has his other son, David, and David’s son, Adam, helping out on shoot days too. For Sammy and his team, conservation, as with Jamie, Lord Hamilton, is key, and he realises that for game shooting to work it has to be carried out in conjunction with managing the land correctly. Echoing Jamie’s comments Sammy said: “It’s all about conservation, it has to be. Take the woodcock for example, we have created special game shooting conditions for them that hasn’t been detrimental to the woodland. Combine that with the fact we don’t overshoot them, and you see how we’re trying to create a decent environment for them. I think we’ve got it just about right here. A working estate that is conducive to the surrounding land and community certainly seems in evidence here, and a lot of the game goes back in to the rural community too. “Making good use of game is paramount on the estate,” said Jamie. As well as supplying the local trade we also supply restaurants in Belfast and Dublin. The estate also has a EU approved game processing facility, one of only two in Northern Ireland, where we can prepare oven-ready birds. Full game preparation is now very much of the business and this also includes venison - approximately 250 head of venison were prepared at the last count. We closed the day with Ramps. With the stunning house in the background, the guns saw good birds before retiring for a cup of tea, and for those staying the night, something a little bit stronger. For me, it was a trip back to the airport and a head full of memories from a great day". Mr Upton married firstly, Mary, only daughter of Roger Boyle, Earl of Orrery, by whom he had no issue; and secondly, Margaret, daughter of William Stewart, of Killymoon, County Tyrone, which lady died also without issue; and thirdly, Jane, daughter of John Ormsby, of Athlacca, by whom he had an only daughter, ELIZABETH ORMSBY UPTON, who wedded, in 1732, the Rt Hon Hercules Langford Rowley, and was created a peeress of the realm, in 1766, in the dignity of Baroness Summerhill and VISCOUNTESS LANGFORD, of Langford Lodge, County Antrim. JOHN UPTON (1671-1740), of Castle Upton, MP for Antrim County, 1725-7, a military officer, who distinguished himself at the storming of the citadel of Liège, and at the Battle of Almansa, under Lord Galway, where, for his spirited conduct, he obtained the command of a regiment upon the fall of Colonel Killigrew. CLOTWORTHY UPTON (1721-85), who was elevated to the peerage, in 1776, in the dignity of Baron Templetown, of Templetown, County Antrim. His lordship was advanced to the dignity of a viscountcy, in 1806, as VISCOUNT TEMPLETOWN. The 1st Viscount was succeeded by his eldest son, the 2nd Viscount, who never married; and, on his death, the titles passed to his younger brother, the 3rd Viscount, who was a general in the Army and also sat as MP for County Antrim from 1859-63. He was succeeded by his nephew, the 4th Viscount, who was the son of the Hon Edward John Upton, 4th son of the 1st Viscount. His eldest son was killed in the 1st World War and he was succeeded by his 2nd and only surviving son, the 5th Viscount, for many years a member of the county council of the Stewardry of Kirkudbright. He had one daughter but no sons and, on his death in 1981, the titles became extinct. Other former seat ~ Wonham Manor, Surrey. Former London residence ~ 10 Hill Street, Berkeley Square. Templetown arms courtesy of European Heraldry. First published in March, 2010. THE RT REV EDWARD KING (1577-1639), born at Stukeley, Huntingdonshire, was elected Fellow of Trinity College Dublin, 1593, two years after its foundation, and consecrated Lord Bishop of Elphin, 1611. Bishop King was buried at Elphin, where he built a castle and acquired landed property in the neighbourhood. Mary, m 5th Viscount Bangor; accidentally killed. HENRY LOUIS MAHON JP DL (1860-1922), of Ballylin, High Sheriff of King's County, 1903, eldest son of Ross Mahon, of Ladywell, by Harriett his wife, daughter of the Rev Henry King, of Ballylin. 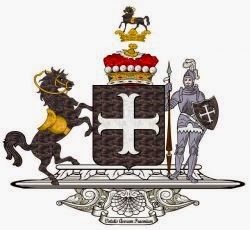 He assumed, by royal licence, the name and arms of KING in lieu of his patronymic, MAHON. MAJOR GILBERT MAHON KING, born in 1905, whose last known address was at Mullingar, County Westmeath. BALLYLIN HOUSE, Ferbane, County Offaly, was a two-storey, early 19th century villa designed by Richard Morrison. It had a three-bay entrance front, with a side elevation with one bay on either side of a central curved bow. An advertisement in Faulkner's Dublin Journal on April 2nd, 1757, offered part of Ballylin's demesne lands, then in the possession of Lucy Armstrong, and consisting of 160 acres, to be let, along with the dwelling house, stabling for 16 horses, a large orchard and a walled garden. 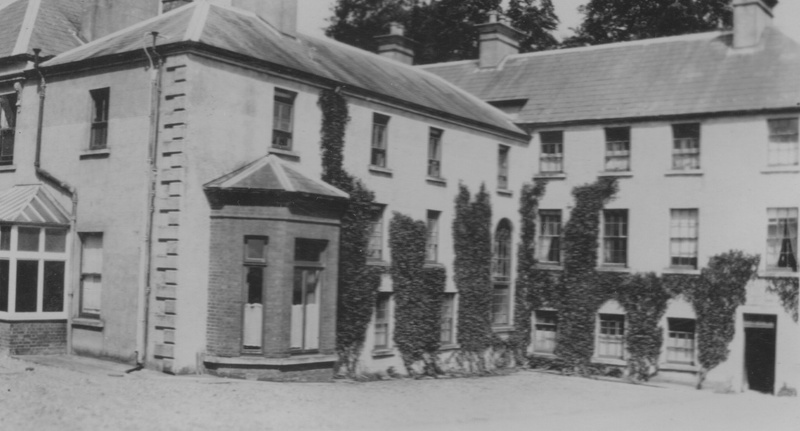 It was purchased by John King about 1761, and so began a long association with the King family, which lasted until 1936, when the demesne was sold and it became an intensive farming operation. The house was abandoned "and eventually unroofed to avoid rates". By 1947, the house was demolished and the stones were "dumped in amongst the foundations of the local power station". 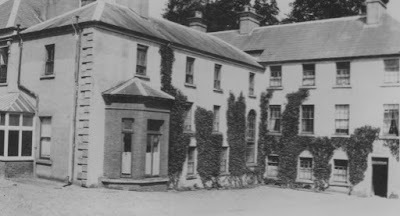 Before this sad end, however, the house had been painted by Mary Ward, the gifted youngest child of the Rev Henry King who had inherited the property in 1821. His wife was Harriette Lloyd, sister of Alice Lloyd, mother of the astronomer 3rd Earl of Rosse. Young Mary Ward was also interested in science and "shared the experience of building the Leviathan, the great telescope at Birr, between 1842 and 45". Mary Ward died abruptly in 1869, when she fell from Lord Rosse's steam engine and was crushed. 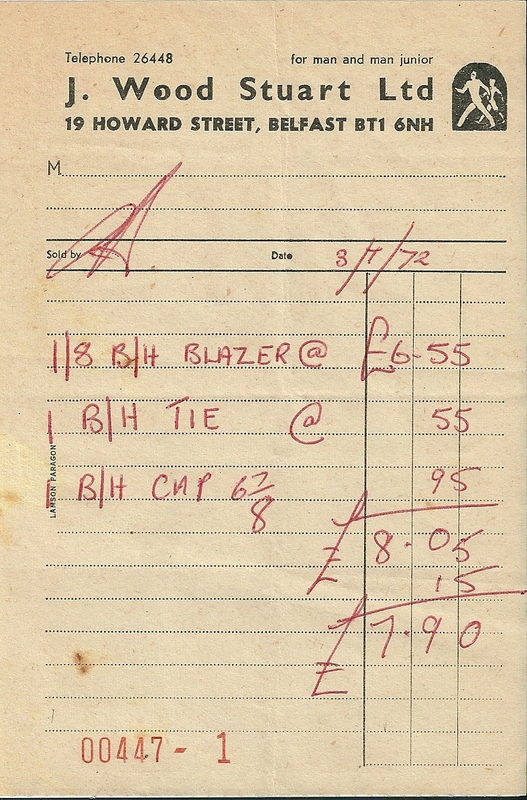 When I was a lad at prep school the uniform was supplied by a shop called J Wood Stuart, 19 Howard Street, Belfast. Their motto was for man and man junior. According to my Bank of England inflation calculator, that is about £80 in today's money. 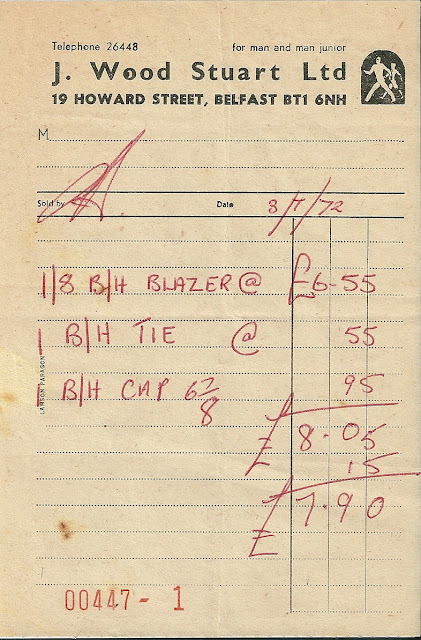 The young Brackenbrian in the image below must have been en route to or from a Games Day, because we wore shirts and ties. Incidentally, they weren't overly generous with the discount! The family of CANNING has been of distinction in England since the reign of HENRY VI. The lands of Foxcote, Warwickshire, were in this family for more than four centuries. GEORGE CANNING, a younger son of Richard Canning, of Foxcote, Warwickshire, and Elizabeth Petty, his wife, had a grant of the manor of Garvagh, County Londonderry, from ELIZABETH I, and settled there. GEORGE CANNING (1770-1827), who having passed through Eton and Oxford, with more than ordinary éclat, entered early into public life, and became distinguished as a political writer, and one of the most eloquent parliamentary orators. Mr Canning filled, for several years, some of the higher offices in the government, until eventually, sustained by his own transcendent talents, and enlightened views alone, he reached the summit of a statesman's ambition, and became (in 1827) PRIME MINISTER; but scarcely had the hopes of the nation been raised by this most popular appointment, than it pleased Providence to render those hopes delusive - the Right Honourable gentleman's death ensuing a few months after his elevation. His third son, Charles John Canning, was created, in 1859, EARL CANNING. GEORGE CANNING (1778-1840), first cousin of the prime minister, who was elevated to the peerage, in 1818, in the dignity of BARON GARVAGH, of Garvagh, County Londonderry. He married firstly, in 1803, Georgiana, fourth daughter of Robert, 1st Marquess of Londonderry, by whom he had no issue. His lordship was Lord-Lieutenant of County Londonderry in 1840. CHARLES JOHN SPENCER GEORGE, his successor;Conway Stratford George. ALEXANDER LEOPOLD IVOR GEORGE, his successor;Victor Stratford de Redcliffe;Dora Valerie Patricia; Daphne Rose. 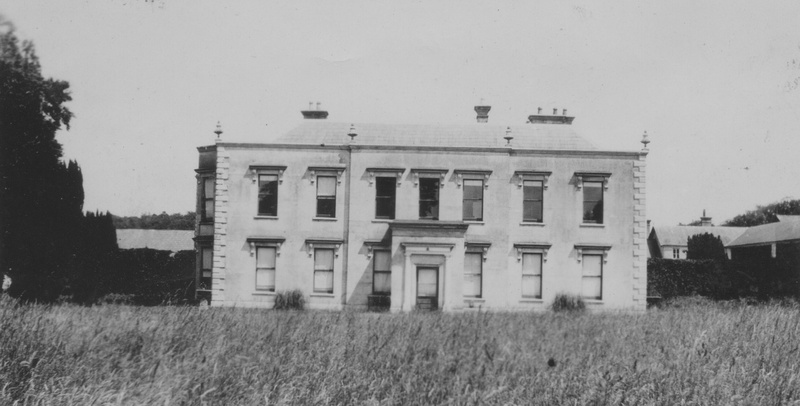 GARVAGH HOUSE, County Londonderry, is claimed to have been first built in the early 17th century and enlarged twice thereafter. The local education committee decided to demolish Garvagh House and to build a new primary school on its site. 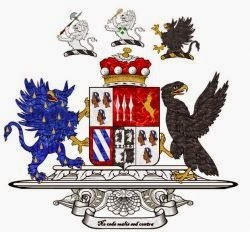 The family association with the Garvagh area began in 1615 when George Canning, of Foxcote, Warwickshire, was appointed as agent for the Ironmongers' Company of London, a company actively involved in JAMES I's plantation of Ulster. To begin with, the townland of Garvagh was not part of the Ulster Plantation, as it had been granted to Manus O'Cahan, the local Irish chief, as a native freehold. After the Great Irish Rebellion of 1641 the situation changed, when O'Cahan joined forces with Sir Phelim Roe O'Neill in the insurrection and, as a result, he lost the freehold. In 1649, one of George Canning's sons, Paul Canning, acquired the townland of Garvagh and began to develop it, by first building St Paul's parish church, which initially was intended as a private chapel for him and his family. The village of Garvagh lies between Coleraine and Maghera. I'm grateful to the Craig family and Coleraine Museum for making this possible. 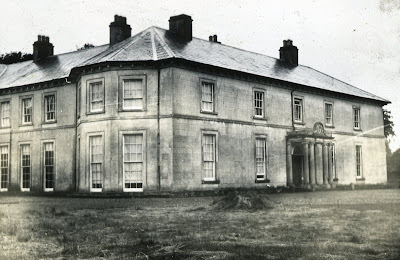 I have written about the House of Canning. Garvagh arms courtesy of European Heraldry. First published in March, 2011.